Black and white postcard of crowds enjoying Belle Isle Park, in Detroit MI. A number of people are rowing or paddling on the canal that bisects the park. 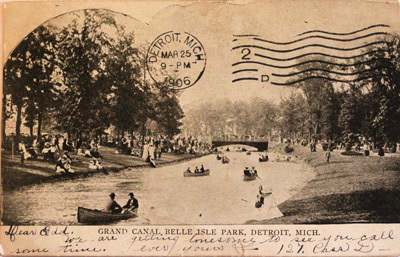 "Grand Canal, Belle Isle Park, Detroit Mich"
Handwritten: "Dear Edd, We are getting lonesome to see you call some time. ever yours 127. Chas D.